I’m making this post way too late. I started it over a month ago and am now rewriting it to make it current. But in another sense, I’ve had some time to stew on what I’ve been able to take away from living in Korea for a year. I’m back in Canada, I’ve been for about 3 weeks now. I’m in a sort of disbelief. I can’t believe how fast the year went by. Even more mind boggling is the amount of experiences I’ve had and lessons I’ve learnt about life and myself in this time. I left Canada around the same time last year for Korea, coming back during the same time of year truly makes it feel like I almost never left. It seems like only a few weeks since I drove downtown, seen my friends and family, and was at my lake house. Yet when I look back at my time in Korea, it was such a dense year. Filled with many different people and experiences. Lately I’ve been trying to remember why I really chose to go to South Korea. What had I expected of the country and what had I expected to learn there? I can’t even remember how I broke the news to my friends and family I would be leaving for a year. I do remember I was nervous. I’d never been away from home or my immediate circle for that long. Would life move on without me? Would I move on in a different direction from them? I remember distinctly finding solace in a story my grandmother told me of how she met and got married to my grandfather. They met a few months before he left for WWII in Europe. He was gone for 6 years. They stayed in occasional contact through radio messages and the odd letter that came every few months. Suddenly a year didn’t seem to bad. And now it’s all over, yet here I am. Dare I say mentally stronger and more able than before I left. 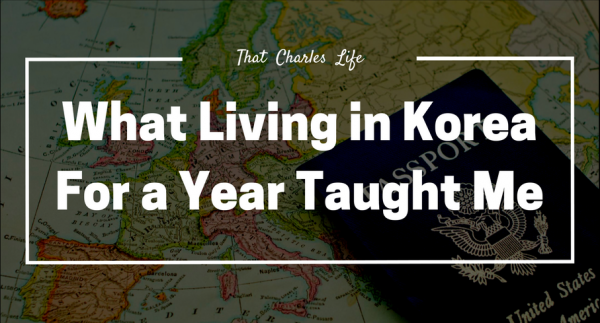 Here is what living in Korea for a year taught me. This was one of the biggest learning experiences for me since arriving in South Korea. I’ve learned this law of living to be true in all areas of life. It’s not like in Canada I didn’t take action to make things happen for myself, I did. But not nearly enough. I relied on others to fall back on, and for things to fall into place. In a sense I was passive to some forces of, and areas in, life. That is a childish way to live. I went on a few trips over my year in Korea. A few factors I left to fall as they would, out of laziness and lack of active effort. I ended up wasting much time and money to correct the errors that ensued because of not taking proactive action. In addition, the way people do business in Korea is different from the way it’s done in Canada. Employers for example, seem to be slower to deliver on your requests, so you must be very proactive for your ‘rights’ to be met. I’ve spoken many times before that when living abroad you are left to completely your own devices in a land that speaks other languages than your own. This makes the simplest of tasks in your home country complex and difficult. Nothing will get done if you aren’t adamant on completing tasks. I met many people from all over the world during my year living in Korea. They came from different walks of life, with vastly different opinions, attitudes and experiences. Getting a chance to expose myself to these people and their views of the world was enriching. It also helped me discover some of my true values and beliefs more accurately. I’ve since been able to establish what is more important to me personally. I also became more vocal about these opinions and was met with more disagreement in discussions than I ever have been in my life. Back at home, the people I usually associated with shared many of my values and views. That and I wasn’t as set in my views or as vocal about them. Having the chance to disagree with people and discuss differing views show that you have something to stand for and something you believe in. If you aren’t ever met with disagreement, you aren’t defined by anything. Within the first few weeks of living in Korea I started writing again. This isn’t the first website/blog I’ve started and I doubt it’ll be my last. My first website I ran with for about 6 months before it fell off and I abandoned it. I always told myself I would start another one or begin writing consistently again. It took me over a year to do it, but I’ve started again and remained consistent for the most part. Writing isn’t my dream, but the habit of it and having this website are important aspects of where I someday want to be. The extra time and perspective of being alone in the world for awhile gave me the clarity that the best time to start going after what you want is now. Since I’ve gotten back to Canada, I’ve enrolled back in school with a defined path in mind, and have already started to look into my next travels and some new hobbies. This point ties into meeting many people and discovering your true belief system. Being back at home like I stated, I mostly surrounded myself with familiar people or people who shared my beliefs and views. They were who I spent the majority of my time with. I was in a bit of a bubble so to speak. It’s great to have close friends; it’s comfortable and I am constantly grateful for those people. But the problem is that you get set in a bit of a feedback loop. You get comfortable, and since your friends already like you it’s hard to determine how you are truly perceived by the people around you. When you are exposed to a tirade of new and differing individuals, without your entourage, you get to see how people around the world truly take to you. I am not saying you should change who you are to satisfy people. There are many particular parts about who I am that don’t jive with the majority of people am I am fine with that. But it is powerful to know how people perceive you. It gives you keys to be able to change what isn’t working for you as a person, or who to manipulate your actions for a desired result. Previous to leaving for South Korea I had always dreamed of extended world travel. But it just never seemed within grasp or a reality for me. Now being back in Canada, I am realizing how easy it is to book a flight and plan a trip. And how travel is truly less of a financial burden than most might think. Living in Korea I had very few bills. Granted my apartment was covered for me, even if it hadn’t been I would have still had fewer bills than I do here in Canada. Travellers are generally frugaler than people living at home with their mortgages and toys and extravagant lifestyles. If you can find a job abroad or a way to make some modest money – like teaching English online, extended travel is certainly possible. Finally, I was reminded everyday as I walked to school or took the bus to various parts of the country how important travel is. Travel can be cheaper than you think, but it’s not free. And a lot of times you sacrifice the opportunity to make money and build a career for yourself when you take up extended travel. But travel needs to be considered an investment in itself. I suppose it’s not for everyone, but once you begin seeing the many different wonders the world has to offer.. I still view my experience living in Korea as the best choice I’ve ever made in my life. If you are interested in learning more about going abroad to teach, or simply have an extended world trip planned, I would love to hear about it or provide advice where I can. Feel free to reach out or leave a comment. Thanks for reading and the comment J Money! Yeah Korea is totally underrated in my opinion. I will definitely go back some day. Have you been back since? That’s an awesome story! I am originally from Manitoba, as you may know from reading. Did you experience the winter here? Thanks for reading and your comment! Great to see this posting. You are right. We must take action to make the dream come true. Even if it does not come true, at least we know that we have tried but failed. And hopefully you learn something from a failure that you can apply to your next endeavor. Thanks for the comment Ben! Nice thought about Korea for a year.